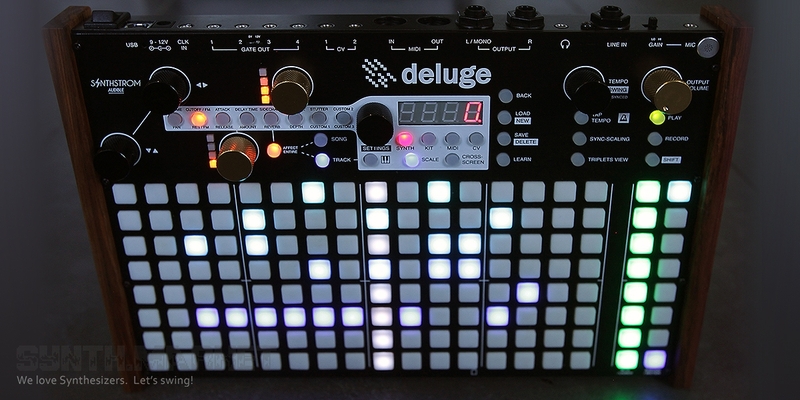 Deluge is a flagship instrument of Synthstrom which went through 3 years of developing process. The synthesizer is standalone and multipurpose integrating a sequencer and sampler. The core is based on the sound engine featuring subtractive and FM synthesis. The instrument provides up to 48 simultaneous synth voices or 64 sample voices with polyphony limited only by CPU. There are two endless encoders for parameter adjustment on the fly. Parameter automation recording, arpeggiator, dedicated volume and tempo knobs are included. The mod matrix allows for many modulation options, while LFOs and envelopes are offered per synth/sample. Synth engine features LPF / HPF, FM, portamento, oscillator sync, ring modulation, unison detune, and more. There are 4 basic waves presented and you can load a WAV file from SD card. FX is represented with delay, reverb, chorus, flanger, phaser, bitcrusher, sidechain effect, live stutter, and more. The sequencer offers 128 RGB pads, sequencing limited only by device RAM, simultaneous output to 16 MIDI channels, 2 CV / gate channels and 2 additional gate outputs, in addition to internal synthesizers / samples and many more features. The sampler streams samples from SD card (no RAM limitations), offers time stretching, resampling and slicing feature. The sampler part features same filters, modulation matrix and FX as the synth engine. 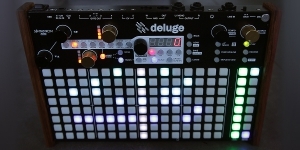 Synthstrom developers, a New Zealand based company, reported on some innovations, which will bring a new firmware for their product - Deluge, a synthesizer, sequencer and sampler all-in-one box. They promise 30 times more memory to work on the project and a lot of new options. The firmware will be ready by June, but for the first time you can see it during the Superbooth 2018 - the exhibition of musical equipment that will take place in Berlin at the beginning of May. Deluge workstation is a flagship Synthstrom Audible product which was released as a result of painstaking and diligent work. Since it was announced last time the instrument sticking to “all in one” kind of approach has been a little bit elaborated. Besides, there were some videos made which can guide users in order to ensure the employing of possibilities offered by Deluge to the fullest. Synthstrom Audible company is ready to release an incredible synthesizer, sequencer and sampler in one housing! The instrument will be presented on 1st of October 2016 during A-Synth Fest (held in Switzerland). So what exactly we’ll be introduced to and which features will try to make musicians happy?